We also offer a made to measure service for those who require a custom size mattress. If you can draw it, we can make it! Get in touch for more information. Ideal for boats, motorhomes, camper vans, caravans and odd size bed frames! The 0.99p option is for a custom size quote only. Premium Memory Foam Mattress. 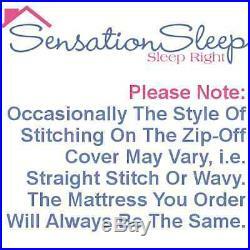 We get tons of repeat orders and referrals from this mattress. This is evident when lying on the mattress for the first time. Why our Premium Memory Foam mattress? High Density Memory Foam: Our mattress is constructed using specially selected materials that provide the ultimate sleep experience. Our mattress has an incredible high quality feel to it which is further evident when sleeping on it for the first time. Pressure Relief: Memory foam provides even support for your body by distributing weight across the surface. In many other types of beds, pressure points are created as the heaviest parts of the body like shoulders and hips support a majority of the sleepers weight. By eliminating pressure points, you will toss and turn less at night reduce daytime pain as well. Supportive : People suffering from back problems especially appreciate memory foam because it provides the support that is needed to relieve the body of stress and tension while you sleep. One of the greatest advantages of this material is its ability to conform to your body and keep your spine in natural alignment, rather than forcing it to assume a linear shape. No Motion Transfer: Many couples find memory foam to be ideal because they can finally sleep soundly with their partner. If one person moves or gets out of bed, the mattress transfers very little motion through the foam. Memory foam shapes only to the pressure directly applied to that one area, this means that the surrounding areas remain unaffected and reduce night disturbances. Durability: Memory foam mattresses are known for lasting much longer than average spring mattresses. Should a fault arise due to manufacturing faults then your covered by a 5 year guarantee. Made To Order In The UK: When you place your order for our Premium Memory Foam mattress, we wont just send you out a mattress that has been sitting in storage for months, we manufacture your mattress just for you. What is Memory Foam? Memory foam is polyurethane with increased viscosity and density. It is often referred to as viscoelastic polyurethane foam, or low-resilience polyurethane foam. High-density memory foam softens in reaction to body heat, allowing it to quickly mould to a body. Memory foam was developed in 1966 under a contract by NASA to improve the safety of aircraft cushions. Memory foam became common in hospitals and medical settings. It was commonly utilised in cases where the patient was required to lie immobile in their bed for an unhealthy period of time. Memory foam mattresses significantly decreased the level of surface pressure on the patients body which often decreased or stopped blood flow causing pressure sores or gangrene. An absolute must have if you are a back pain sufferer or wake up with aches and pains! Say goodbye to the unpleasant sensation of stiff springs that cant naturally conform to the shape of your body, and say hello to a sleeping surface thats made specifically to fit around you! The sensation of built up pressure caused during sleep is a thing of the past with memory foam. Get used to waking up feeling great! Zip Off Quilted Cover. This mattress also features a luxurious gold dot quilted cover. The cover is fully removable and zips off with ease. This allows for easy cleaning of your new Memory Foam Mattress and allows you to maintain freshness for longer! The 4-way stretch fabric allows the mattress to fully shape around you without the tightness of an outer cover adding extra resistance. To help further enhance the life of your new Memory Foam mattress, it has been specially treated with Ultra Fresh Antimicrobial Protection to help further enhance the life or your mattress and help reduce bed bugs and dust mites. All Regular & Custom Sizes Available. We are pleased to offer this mattress. To order in all shapes and sizes. Standard off the shelf sizes are. For information on made to measure please get in touch. If you can draw it, we can make it, no matter the shape or size! Luxurious zip off quilted cover. Pressure relieving memory foam. Reflex foam base offers support. Made in the UK. Made to measure available. 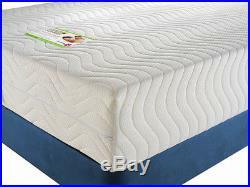 Customer reviews for Premium Memory Foam Mattress. Great mattress, wasnt expecting anything so good for the price! Fantastic service and communications. Never slept on a foam mattress before, but Id just built a new bed and thought Id treat us to a new mattress. The mattress is brilliant, so comfortable! In over 3 months now neither of use have had a bad sleep on it. Really enjoy waking up refreshed every morning. Thank you so much! I bought this mattress and thought it was just a cheapy as the price was very reasonable. How wrong was I! This is the best mattress I have ever laid on! It is the most comfortable mattress imaginable. I also bought a bed through this company and it was easy to put together and looks amazing. There is just 1 downside You dont want to get up for work in the mornings : Thanks guys A++++++ all the way : My sister has just ordered 1 too! I will be telling the whole family. Thank you very much. A wise man once said.. Never fear Were always happy to help. Other areas such as the Scottish Highlands, Isle of Man, Northern Ireland etc may require a small additional surcharge. If in doubt please get in touch! If you have not. When the item arrives please check for potential damage. If item is damaged please sign received as damaged. We are unable to resolve damage related issues if you did not sign as damaged. Incase of delays, do not dispose of your old mattress until the new one has arrived. Allow extra time for arrival during bank holiday periods / other national events / strikes etc that may cause delays for couriers. Occasionally the design of the outer cover can vary slightly. This will only be the visual design and not have any other effect on the mattress. Our mattresses are sent vacuum packed and rolled for ease of transportation and easy installation. Lay the bag on the bed, carefully cut the plastic and watch it unroll and expand into place. Please leave the mattress for 5 – 6 hours to fully recover after vacuum packaging before laying on it. It is common for brand new foam mattresses to have an initial odour after unpacking. This smell typically lasts lasts between 1-4 weeks and then completely goes. Some people may report this smell as unpleasant for the first few weeks. As the mattress is used, the compressed pushing the odour out fresh air is sucked back into the foam. The 0.99p “Custom Size” option is for a custom size quote only. We will do our best to ensure that your order is delivered within the timeframe advised in the item description, but under no circumstances will we compensate or be held responsible for any cost or inconvenience that may be incurred due to delays with deliveries. By ordering this product via this listing you agree to be bound by our full terms and conditions. (2ft6 UK Small Double: 75cm x 190cm). (3ft UK Single: 91cm x 190cm). (4ft UK Small Double: 120cm x 190cm). (4ft6 UK Double: 137cm x 190cm). (5ft UK King Size: 152cm x 198cm). (6ft UK Super King: 183cm x 198cm). (European Size Single: 90cm x 200cm). (European Size Double: 140cm x 200cm). (European Size King: 160cm x 200cm). Custom sizes are also. Please ask for details. If collection needs to be organised by ourselves, the collection charges will be passed onto the customer. 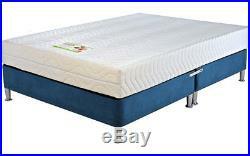 The item “UK MADE King Size 5ft Memory Foam Mattress DELIVERED NEXT DAY” is in sale since Monday, July 22, 2013. 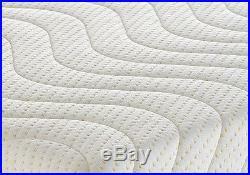 This item is in the category “Home, Furniture & DIY\Furniture\Beds & Mattresses\Mattresses”. The seller is “distinctiontrading” and is located in Rochester Kent, GB. This item can be shipped to United Kingdom.